Collingsworth Public Library is a collaborative effort of the Wellington Independent School District and Collingsworth County. The library opened in the fall of 1988 and is open year round with extended hours two nights a week. The library is a member of the Harrington Library Consortium and is a TexShare library. The Wellington Elementary Library is housed in the WISD Elementary Building located at 609 16th Street. The elementary library is open during school hours only. Collingsworth Public Library functions as an open access educational and recreational agency serving the Wellington Independent School District and Collingsworth County. The Library strives to be the learning center of the county and the place people turn to for the discovery of ideas, the joy of reading, and the power of information. Using Our Library Is Easy! Library cards are free to residents of Collingsworth County or the Wellington ISD. A parent's signature is required for children under 18. A picture id is required for adults in addition to proof of a current local address such as a driver's license, electric bill, or water bill. Your card gives you more! 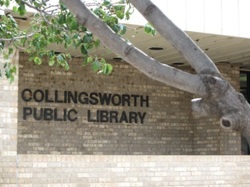 Thanks to agreements among members of the Harrington Library Consortium, your Collingsworth Public Library card can be used at dozens of libraries around the Texas Panhandle, including the facilities at Amarillo College , Amarillo Technical Center , Clarendon College , Frank Phillips College , and Wayland Baptist University. Likewise, patrons who hold cards from any member library may check out most items from the Collingsworth Public Library. Your card also gives you access at libraries all over Texas via the TexShare library card program! You will need to get your TexShare card here at the Library before you visit a TexShare library.